It's hard to believe that this classic skit from Caesar's Hour is almost 60 years old, but here it is again in our series of remembrances of the great comedian. 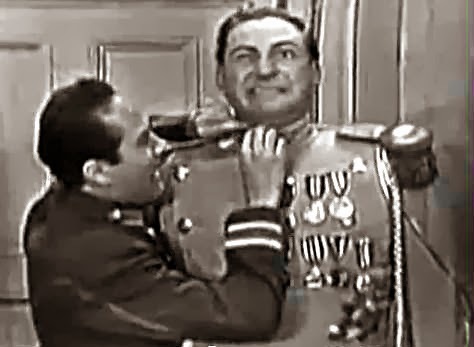 Caesar doesn't miss a detail in his instructions to button the tunic, polish the buttons, dust the epaulettes and medals, and attach the collar, the belt, the sword, and the braids. It takes almost seven minutes for Morris to pay attention to every detail and get Caesar ready -- but ready for what? To go out to battle? To lead his troops? Well, not exactly. Don't miss the last minute when we learn what all the preparations are for. Not that this was all done on LIVE TV with no retakes! !